The concept of the Shemitah has become mainstream in the last few years, but is relatively misunderstood by many commentators, and especially critics who have already made up their minds about the irrelevance of the Ancient Semetic cyclical debt forgiveness mechanism. It is definitely not irrelevant, especially since the Judeo-Christian tradition carries this mechanism in its Old Testament Holy Book, and that Islam also contains traces of laws against usury, and symbolic numerology of seven – and multiple sevens – in its annual rituals such as Hajj and Umrah. When combined, both of these Abrahamic traditions (from Isaac and Ishmael) roughly cover half of the worlds population based on religio-cultural identity, obviously making it far from irrelevant, especially for organized occultists wishing to manipulate its meaning; such as groups practicing Thelemic A∴A∴ (explained throughout my blog). In the Jewish lunar-solar calendar (demonstrated in the above image), the recent set of two seven year periods suggest a Shemitah cycle playing out, the aspects and meaning of which will be expanded on during this post. Any country disagreeing to the terms will be cut off from the world economy, and the leaders of the NWO know this will mean certain domestic political death for any such resisting administration: the ultimate blackmail. We just need to look at Greece to see what happens to nations who are threatened with commercial bank freezes imposed by central fiat mammary glands deliberately removed from the public mouth – they capitulate, then the breast is promptly returned and the baby is given a playful spank. Mummy is in control, babies need to know their place. This technique has been recently deliberately and publicly beta-tested on Greece, in order that the world dêmos understands the consequences of rebellion against un-elected central bankers and fiat cartels. 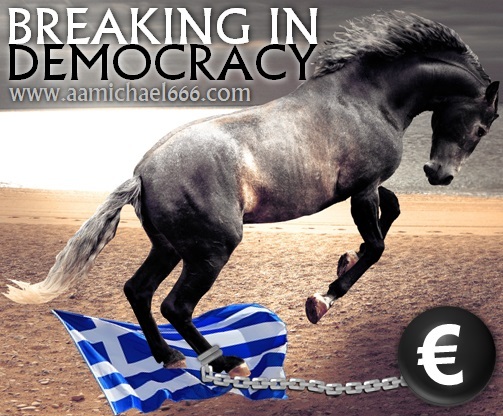 It is no coincidence that Greece is known as the cradle of democracy, because this is actually part of a ritual dismembering of worldwide democratic movements in order to initiate an un-democratic world-wide neo-feudal technocracy, exhibiting features of both fascism and communism. Technocratic feudalism under a globalist oligarchy, is impossible in a world where real choices and power are deliberated at a ballot box. Perhaps ballot boxes will remain in order that the dêmos gets to vote on such things as daylight savings, just to provide some pathetic illusion of choice, or to provide a costly referendum vote on the preferred color of referendum ballot papers – ‘look at how much choice you have!’. Every stallion needs to be broken before it can be ridden, and every slave needs to be broken before they will serve and yield their God given personal liberty (their birthright). The Greek collapse is a calculated sacrifice and beta-test for the New World Order. This is all a BIG ritual. Shemitah and Jubilee relate to human liberty, and the current reigning parasitic oligarchy, will do everything and anything in their power to retain the mountains of debt contracts they have created. The most important and difficult part of this decades-in-the-making New World Order project however, is to unite the MENA energy producing nations into a supra-national structure, to be dovetailed into the European Union in order to displace Russian energy demand, thus hamstringing the Russian Federation.1 We can see this tension playing out in Ukraine and especially Syria, where Bashar al-Assad had previously denied Gulf Cooperation Council overtures to build natural gas pipelines on his sovereign territory.2 This is also why Russia and Iran support Assad so assertively. In order to create an excuse to re-invade the entire MENA with NATO troops working with Saudi, Gulf and Turkish military forces, a Hegelian dialectic needs to play out. All Muslim countries are connected only by Islam and Mecca, thus a Sept 11th 2001 event needs to occur in Mecca in order that a MENA Caliphate can be put together. This is why NATO and the GCC have created ISIS, and this is why the Mecca Clock Tower was built, in order to smash it into the Kaaba and blame ALL non-compliant Islamic elements in the entire MENA. This will provide cover for a supra-national MENA Caliphate with full NATO backing. Muslim majorities will then applaud such an east-west cooperation, making this a very effective Hegelian dialectic. Even more support will be garnered from the Muslim world by a planned UN announcement to split Israel into the three states indicated in the original 1947 partition plan.3 Yes, this will be the grandest Hegelian dialectic of all: the support of 1.6 billion Muslims reinforced by the disenfranchisement of under 7 million Zionists (and I’m not pro-Zionist, I have no dog in the modern Zionist fight for Machpelah-Akeldama).4 This was a very easy calculation to make if you were part of an oligarchy who bear allegiance only to money and power, instead of ethnicity, culture, or national sovereignty. Get ready for the BIG one … the BIG Clock … to announce to the world that it is TIME for the New World Order of anti-Christ. 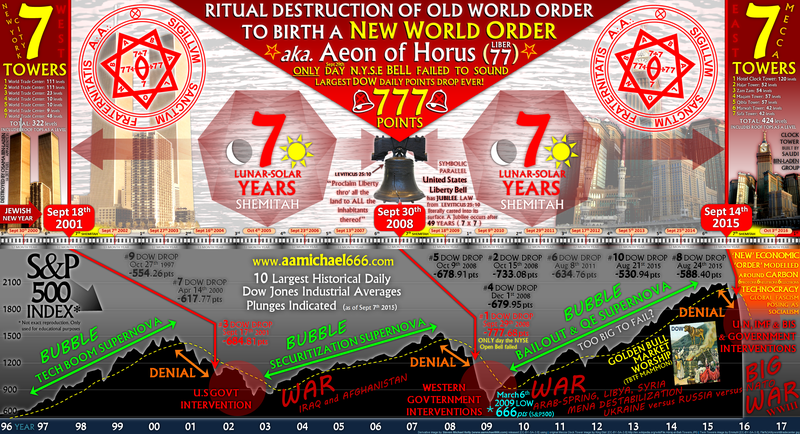 Join me again as I explore the intricacies of this ritual Hegelian dialectic, and the connection with a double-seven Shemitah and Jubilee.